Comics and graphic novels have gained respectability over the past few decades. They now receive cultural awards and attract audiences that were once unthinkable. But even as their stature has grown, they seem to have lost some of the drawing ability that comics once enjoyed. The ability to achieve a likeness, to convey subtle body language or facial expressions, to stage complex scenes, or employ similar tools of visual communication seem largely missing from many of the most prestigious comics and graphic novels today. 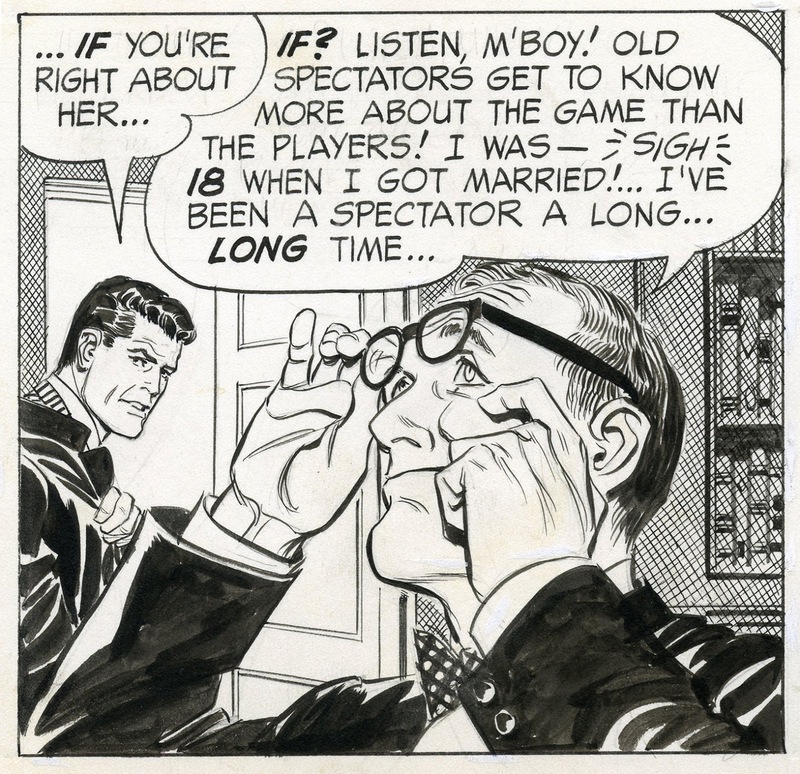 Superstar comic artists such as Speigelman, Ware, Panter, Brown, Beaton, Trudeau, Bechdel and many others simply don't speak that visual language. Perhaps it's because they have different aspirations for their art. Perhaps it's because they don't draw well enough to employ the vocabulary. Perhaps those two reasons are related. I can think of no better example to demonstrate the lost language than Leonard Starr's intelligent and graceful strip, On Stage (1957 - 1979). Every day for the next few days I am going to focus on a different aspect of Mr. Starr's visual storytelling. Today I would like to show how he uses the language of hands. Hands wiping away a mock tear enrich the tone of the words. This gesture of the kiss off adds a visual punctuation mark to the text. But you are not likely to see these kinds of tools employed in today's esteemed graphic novels. Many of today's artists can draw hands performing basic functions such as holding a coffee cup or throwing a punch, but have lost the ability to use the language of hands in this more sophisticated manner, to enhance the expressiveness of the drawing. 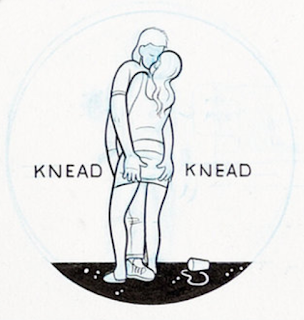 In all these cases, words prop up mediocre drawing, rather than the drawing enhancing the words. ...while in the next drawing (honored by the Smithsonian Institution in its 2004 Smithsonian Book of Comic Book Stories) the hand either conveys that the man is picking his nose, or scratching his cheek, or perhaps thinking, or perhaps something else. This disparity in powers of observation and technical skill, and in the ability to orchestrate multiple levels of information in a single drawing, is hardly uncommon. The drawings in today's most esteemed comics have generally become simpler, rougher and less informative. Chris Ware depicts a hand to help convey emotion using his "abbreviated visual words." Ware's drawing is mediocre, but in fairness he seems more interested in the ornate architecture and design of his "symbolic typography"
There are many reasons, some of them better than others, for the simplification of comic drawings and the de-emphasis on technical skill. Even Starr simplified his drawings in later years to meet a changed market. Simplicity is a great virtue in drawing, but simple-mindedness is not. We see some of each in today's award winning comics, but we should endeavor not to confuse the two. That's why I'll be spending a few days musing about what we have gained and what we have lost as a result of this migration in comic drawing styles. Good catch, David. I never followed On Stage back in the day, so Starr's use of hands is new to me. But boy, could that guy draw! Yet as you hint, so could a number of other comics artists. Alex Raymond, Austin Briggs, Stan Drake and John Prentice are a few who come to mind. Since show biz didn't interest me all that much, and there were all those other guys who could draw well, I didn't give Starr his due. But I shoulda. You always make me want to do better in my own work. Back to the drawing board. A major factor in the change in comic art style is the change in the value given "good drawing" by tastemakers and critics who decide which comics are great. Regardless of the quality of the story, if something too well drawn it's automatically presumed to be shallow and reactionary. I suppose this is fallout from the days when classic-style drawing was associated with solidly bourgeois publications like The Saturday Evening Post. Maybe the pendulum will swing back someday. it's not that artists today have 'lost the ability' to draw hand gestures; you're just presenting examples of ones who use a simplified, cartoony language against someone who drew in a much more 'realistic' manner. Ware calls himself a 'cartoonist' and in the introduction to McSweeney's No 13 admits that "cartooning isn't really drawing... a cartoon drawing lives somewhere between the worlds of words and pictures, sort of where road signs and people waving their arms in the middle of lakes operate". you're comparing two very different approaches. Scruffy-- I react the same way to these drawings; they make me want to do better in my own work as well. Thanks for writing. The acting of the hands is very nice, but also very theatrical. I'm sure that if you look at modern superhero comics, you might find other examples of this kind of excessive body language. But this dramatic acting does not fit in graphic novels, that have a totally different atmosphere that requires a much more subtle way of acting. 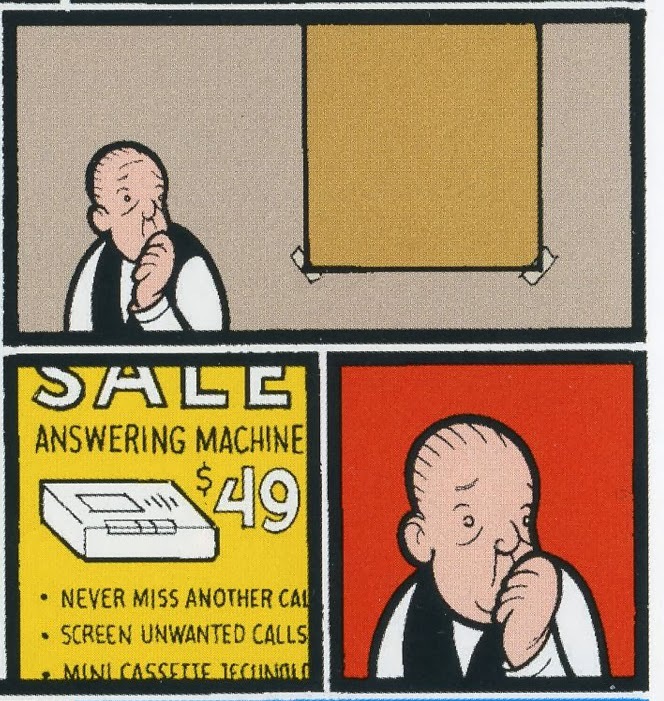 It's a comic language that Chris Ware is actually a master of. Smurfswacker-- I'm sure there's no single reason for the change in taste. 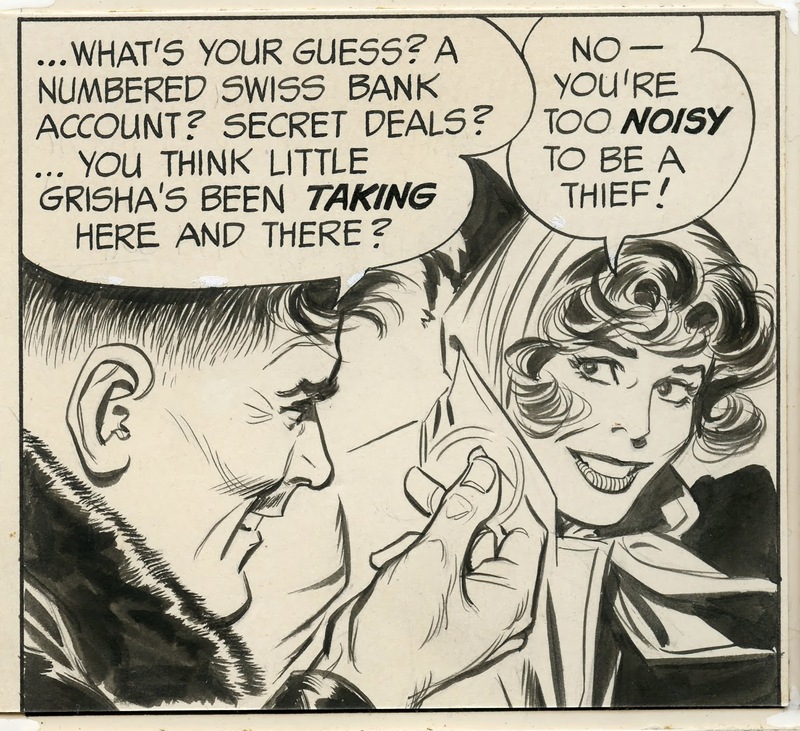 Surely some of the blame has to be attributed to the downfall of newspapers; Alex Raymond or Hal Foster used to have an entire page for careful, detailed drawing, and the readership to make it economically worthwhile for the artists. TV and the internet pulled away those audiences and their revenues (although you might think the success of graphic novels and internet comics might provide a solution to those size limitations). But I agree with you, traditional drawing skills became suspect at some point. There are reasons why certain of those skills might be less interesting in an era of digital cameras and Photoshop, but many of the critics who disparage those skills don't understand or appreciate their value, and many of the artists who avoid them do so for lack of talent. Laurence John-- I disagree. If you look at the current comic art that has received the cultural accolades, the vast majority of it is by artists with mediocre drawing ability-- the Pulitzers to Spiegelman and Breathed; the museum show, "Masters of American Comics" which lauded Panter, Ware and Spiegelman; the Smithsonian Institution compilation I cited with artists such as Stack, Ware, Seda and the rest of the usual suspects; the hardbound "Best American Comics" series year after year; the deluxe art books with artists such as Gary Panter-- virtually none of those artists employ what I am calling here "the lost vocabulary of visual storytelling." I believe these artists are mostly being honored for their words and concepts rather than their ability to draw. 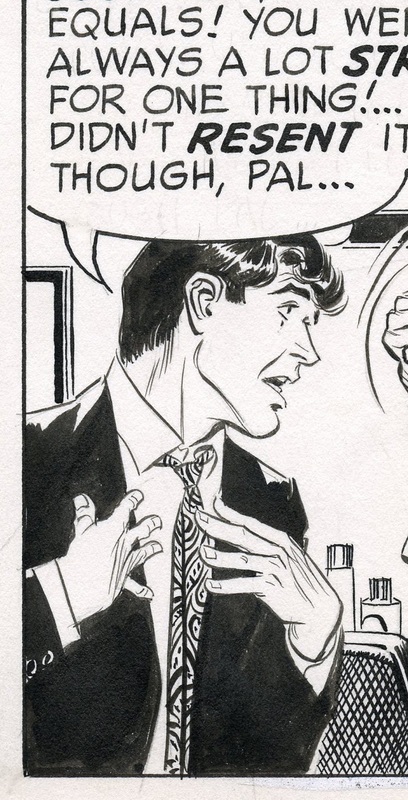 As far as I can tell, even the few currently lauded artists with some draftsmanship ability (such as Hernandez, Clowes, Miller or Gibbons) don't employ the vocabulary of hands the way I've described here. If you have some contrary examples, I would love to see them. I know that Chris Ware "admits that cartooning isn't really drawing." I just never found any reason to believe him. Have you? If graffiti on a men's room wall is drawing, why should I be persuaded when Chris Ware or someone at the New Yorker assures me that these lovely pictures are not? Maaike Hartjes-- I think that "theatrical" is a good word to describe this kind of drawing-- the pictures are certainly "staged" to convey meaning the way a movie director might compose a scene. They orchestrate many kinds of visual cues (line work, darks and lights, composition, facial expressions, body language, etc.) around the message being presented. In fact, so much of commercial picture making during this period was "theatrical" that artists such as Austin Briggs (mentioned by Donald Pittenger) began to specialize in the offhand moment, the unguarded expression, the informal posture). However, I am baffled by your comment that the current comic language "requires a much more subtle way of acting." Gary Panter is about as subtle as a barking dog, and you could say the same for many others in the current pantheon. As for Chris Ware, the only name you mention, I would agree that there is subtlety in his elaborate designs and intellectual constructs but I don't see the subtlety in his drawing (which is the subject of this post). I don't find sensitivity in his line or nuance in his gestures or inspiration in his composition. (I think there is a tendency with artists such as Ware or Brown to confuse "subtlety" with the absence of a pulse.) But I would be very interested in hearing more about your subtlety theory, especially if you can provide me with names or point me to drawings. As someone who contends that we have lost the powers of observation to appreciate certain drawing skills, I need to be sensitive to the possibility that I lack the powers of observation necessary to appreciate the value in some of the drawings I criticize. David, I always enjoy getting a peek into your appreciations. Looking forward to the rest of this series. Regarding the Chris Ware thing, cartooning is very much akin to graphic design. Cartooning is generally thought to be the more expressive side of things, while graphic design tends toward the cerebral. But they are in the same realm of surface symbols arranged in a sign-like way according to a easily apprehendible grammar. The “intellectuals” are most comfortable with graphic design, so where cartoons become like graphic design, they are welcome. Real illustration is a whole other world beyond this, and in my experience, culture-vulture intellectuals can’t stand the intensity of really great visual art, and so prefer the shallow, bland, and reposed. They also don’t like that they can’t read it like text, and thus can’t discover its powers, its mystery. And so they prefer the stuff that is born of the intellect, which can then be disposed of by the intellect, allaying anxiety about their visual illiteracy. And they find ways to put down the stuff they can’t handle. In other words, really good drawing and powerful art is dying, at least in part, because it is too powerful for the tastemakers. They can’t understand it, they can’t control it, they can’t read it, and they can’t handle it. Which is why the tastemakers are part of the problem. I too disagree with Maaike Hartjes’ assertion about subtlety and the nature of the graphic novel. There is nothing about Ware’s work that I find subtle. His visual temperament may be ossified, but it still reads as cartoon shtick. Except without being any fun. David, i have to admit that i'm not personally a fan of your Leonard Starr examples. 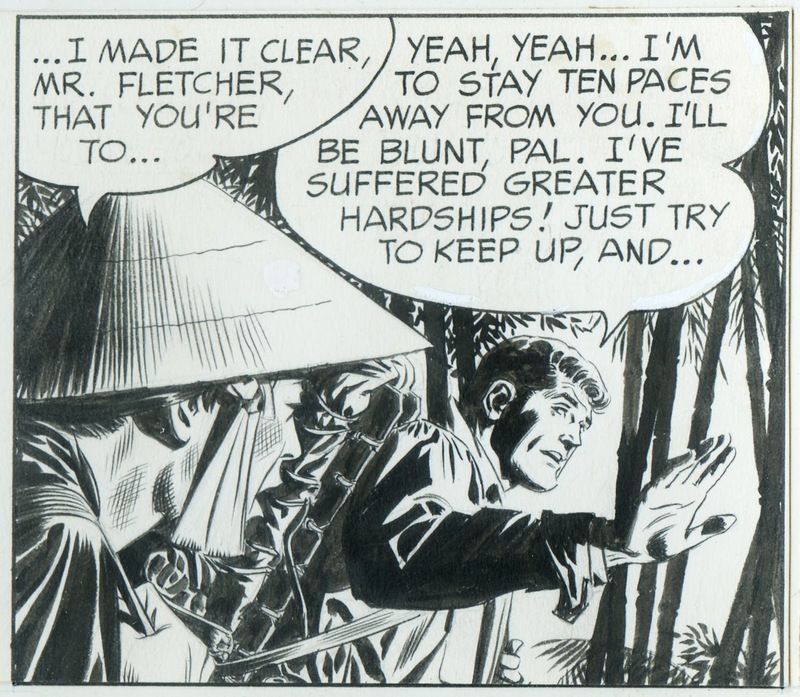 in the UK we have John M Burns (Modesty Blaise) as the exemplar of that style and i'm afraid i find it very stiff and 'hammy' in a 60s b-movie kind of way; the way characters seem to over-act all the time. i prefer the more stylised / expressionist approach of artists like Frederic Bezian, Nicolas de Crecy, Jose Munoz, as well as some on the cartoonier side of the spectrum such as Kaz, Winshluss, Tim Hensley, Jim Woodring. you seem to be troubled by the fact that Ware et al are lauded by the 'tastemakers' while more deserving artists aren't. personally i'm not concerned by what critics think, and i trust that there are enough members of the comic-buying public who are also able to make up their own decisions about whether an artist is deserving of praise or not. i like Ware because i think he does a certain thing very well, not because i've been informed by The Guardian that i should like him, or because i can only read images like text. i like Nicolas de Crecy because of his dexterity as a draftsman; i've never read an article telling me i should like him. i don't understand this either-or argument you're setting up. there's room for all different modes of expression within comics. p.s. by 'subtle' i'm fairly certain that Maaike means underplayed, understated, deadpan, rather than sensitive or nuanced in the way you're inferring. the lack of body language and the proliferation of blank stares might seem like weak drawing to you, but it's actually a major part of the bleak humour. any amount of over-acting would ruin nearly all of Ware's scenarios (although you will see deliberate hammy acting in some of the more b-movie scenarios such as 'Rocket Sam'). Starr is theatrical. His characters moves and faces are excelent actors. He does the best faces. 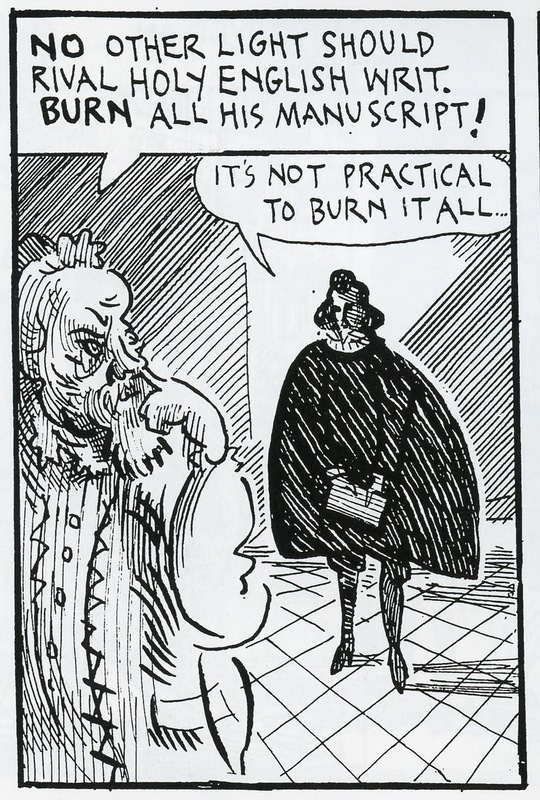 Will Elder in the early Mads, to me, is the funniest artist ever. Elder uses every form of humor available to get the laugh, from slapstick to deadpan, to wackadoo cartooning, comic metaphors, personification, to mixing styles in the same panel, dropping in photos, to various cinematic techniques, etc. And because Elder uses so many different kinds of methods, often in the same panel, we have this blessed thing called variety and this wonderful anything-goes anarchic comic atmosphere. While with Ware, et al, we get a kind of Prozackian sameness. Hard to tell if the Prozackian quality is underplaying, or just existentially depressed and spiritually deadened. In terms of bleak humor, it is far more bleak than humorous, isn't it? I mean, humor still means the same thing it used to mean, right? Like; funny? Rather than merely amusing. Usually, when something is called "amusing" that's a euphemism for lame. At least among everybody I've ever known. of course Ware is depressing, but there are moments in his work that i personally find laugh out loud funny. (there are also very poignant moments too). i would never in a million years expect us all to agree on what constitutes 'funny'. Kev Ferrara-- I guess I understand the distinction between drawing and graphic design at the extreme ends of the spectrum, but there is a whole mid-range (perhaps even the majority of images) where the two categories get mashed together. Where do you place Medieval illuminated manuscripts where word balloons take the form of painted scrolls emerging from the mouths of characters, Egyptian hieroglyphs and Saul Steinberg, Russian icons where figures are created in flat designs for religious reasons, to avoid pretensions of creation, etc. In each case I think we have to do our best to understand what the relevant criteria should be, and judge the art against the aspirations of the artist (recognizing that some aspirations are more worthy than others). Does the narrative nature of sequential art disqualify it? Then what do we say about narrative altarpieces / triptychs by van Eyck, Memling, Bosch, etc? 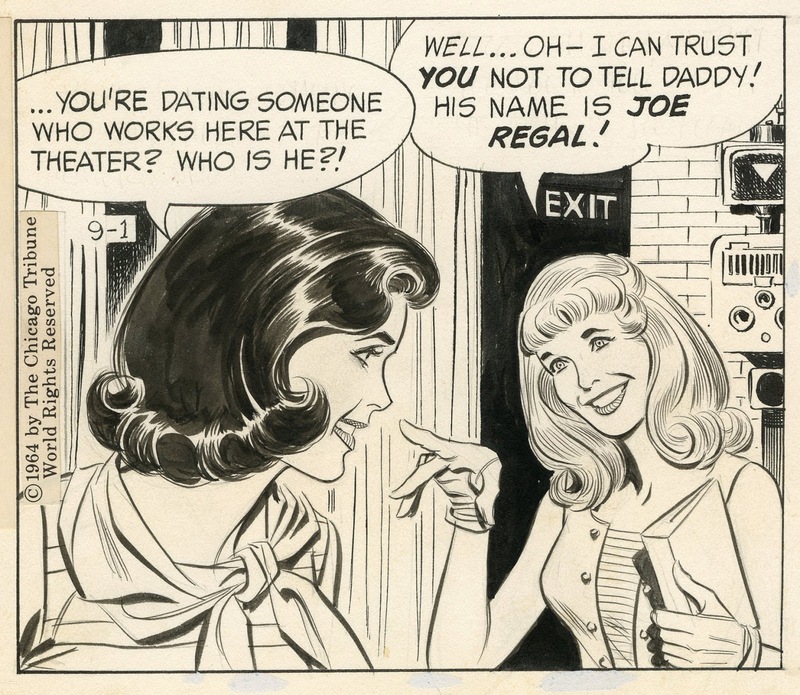 Perhaps to tease out the distinction, I'll ask: how would a single panel by Starr with no word balloons in it be different from what you consider "real" pen and ink illustration (if at all)? As for the "Chris Ware thing," I never want to have a thing regarding Chris Ware-- I think he is sincere and works hard and does some interesting work. Somehow I keep getting dragged back to Chris Ware the way I keep getting dragged back to Frazetta, because he is an unavoidable center of gravity in his field. Commenters such as Maaike keep offering him up as their example. Unfortunately for Ware, he is cursed with a number of vocal fans who write things in museum catalogs like, "I don't think anyone in any visual medium is making art that is more elevating" (for more hyperbole, see http://illustrationart.blogspot.com/2006/02/more-about-chris-ware.html). These people are, in my opinion, comically ignorant about art. I wish I were a big enough person to refrain from taunting them, especially because I don't think Ware himself ever looked for this fight. Laurence John-- you have named some artists that I really like and respect (especially de Crecy and Munoz) and others, not so much. But I agree with you that art is not an "either-or argument," and if it appears that I was setting it up that way, that was definitely not my attention. I do believe that we can (and should) classify art as "good-bad," but as I suggested to Kev above, I think we should measure quality based upon the intent of the art, recognizing that some intentions are smarter, better, more ambitious than others. I don't know any other way to do it (but as always, I would be interested in hearing any alternative test you would care to propose). As for the role of "tastemakers," I find it absolutely fascinating that for so many years comic art was treated with disdain by museums, art critics, publications such as the New York Times, and other pillars of our culture. The barricades held firm through Winsor McCay, George Herriman, Alex Raymond, Milton Caniff, and a hundred other great talents, but finally began to soften as the technical drawing skills of the artist declined. Why did the Pulitzer committee choose this era to wake up? I think there is a lot of truth in Kev's explanation; cerebral types with very little understanding of or taste for pictures are finally persuaded because the subject matter has finally shifted to existential ennui and social injustice, and it was the subject matter they really cared about all along. But there are lots of other potential explanations out there, and I would be interested in your views, and the views of other commenters on this subject as well. I will be off line for a day, but blast away and I'll take it up tomorrow. I would love to see your views on Andrew Robinson. The art in the"5th Beatle" is fantastic. I believe he could keep up with some of the best of the older generation. Love your Blog!!!! Not a big poster but have read this blog for awhile and really enjoy it! The main point of why these undisciplined artists have gained success seems to be getting overlooked. There seems to be a vague concept floating around that some publisher decided cute cartoony drawings are better than well crafted ones, and as a result artists like Spiegelman, Ware, et al became famous. So let me state my view on it - they succeeded because made stories that worked. They didn't succeed due to their impressive art, as is made clear by this article. But stories are a lot more than words and concepts, and also a lot more than the visual storytelling within a panel or page. In fact, what makes a good story is probably impossible to formulate or deconstruct, so I won't even try. But I will say that you can't judge all the elements independently, they all work together or they don't. All those famous undisciplined artists somehow pulled it off, and that's why they sell books and get a response from the media. Not because of their art style. I'm excited to read the rest of this series, I admire a lot about Leonard Starr's work. Also, after all this comparison with artists who have a more cartoony style, I am going to have to take a look at how some masters in this style used hand gesture - Bill Watterson comes to mind. Thanks for all the inspiration as usual! I’m willing to be entertained by Ware if it is possible. The work by him that made you crack up, I’d be interested to read it myself if you’d care to cite its publication or a url. I was making the point that cartooning and graphic design are essentially the same thing in terms of how their symbols are read as a kind of text, and their levels of abstraction, although they are at a distance from each other in terms of the kinds of abstractions they use. And yes, most highly graphic work falls in between the poles, including Saul Steinberg and Egyptian Hieroglyphs. I think illustrations of the Pyle, Wyeth, Booth, Frazetta, Schaeffer school are distinct from this cartoon-graphic design continuum, though using elements of both. Realism is a kind of a third pole in the triad. And most illustration falls somewhere in the gamut pinned at its corners by Realism, Cartooning, and Graphic Design. When literary qualities are dropped back into such illustrations, it shifts the work again in this gamut. For instance, where a sign under a figure reads “truth” and a sign under another figure reads “Cynicism” the picture has been brought into the realm of the allegory, no matter how well realized the drawing. And allegory is very much a text form. What is great to me about art anywhere in the gamut is not where in the gamut it appears, but the degree to which it functions to provide its meaning by virtue of implication and suggestion. (As well as the richness of that meaning). Sequential art has so many added parameters of suggestiveness to distinguish it from how single images provide meaning, that such a comparison won’t provide much light. For very good reason, no single panel on a multi-panel page in the history of comics can stand aside the greatest images of illustration. And it probably shouldn’t. 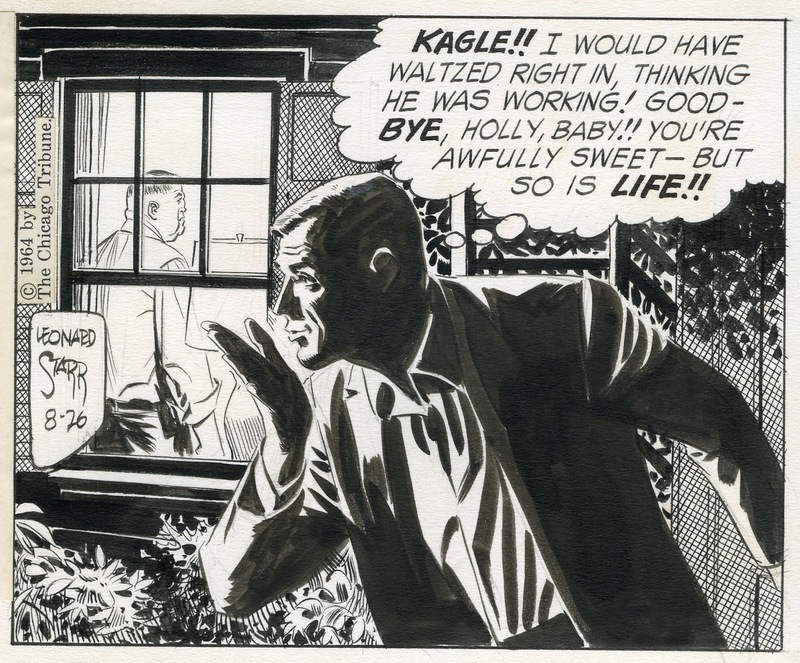 But that takes nothing away from the beautiful, unique tones of Calvin and Hobbes, Toth’s DC horror work, or Master Race by Krigstein. I probably have mentioned it before, but I don’t really care about the “intent” of art at all, because that can easily slide over into: apologetics, historicity, guilty or gilded by association, selling-by-the-mouth, hype, huckstering, and any other method of coiffing the pig you can think of. To prevent all of the above, it seems to me that art must stand alone in its unity as an aesthetic entity. From that vantage, Artwork is what it is, and does what it does. It doesn’t intend. Try looking at good artists as opposed to award winning artists. Have you seen the work of Jimmy Broxton? i'm glad that you're happy for Ware to exist alongside earlier, more 'traditionally skilled' comic artists. i think the medium is big enough to contain all of it, and it's unfortunate if the art-establishment's embrace of Ware sets him on some sort of pedestal; in interviews he seems like one of the most self-effacing humans you're likely to encounter. 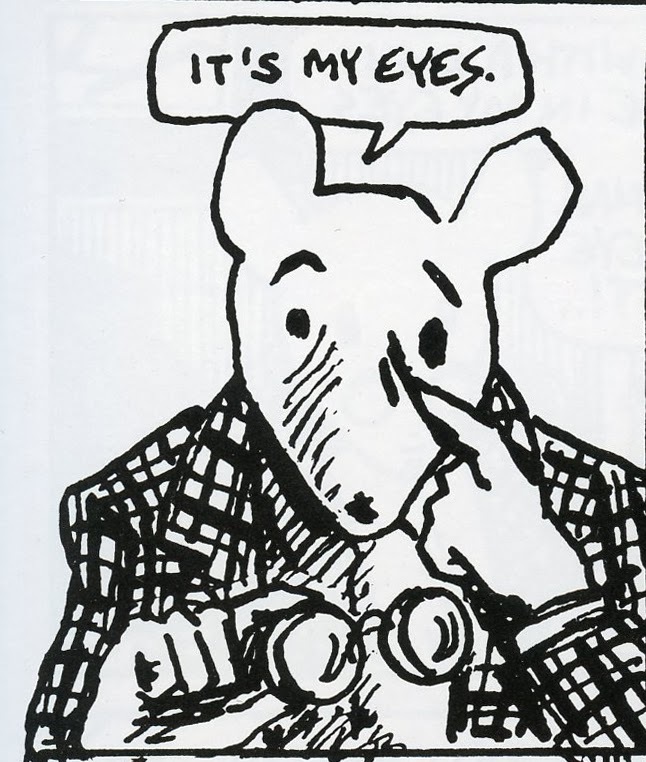 my guess is that Maus won the Pulitzer Prize because of the content rather than the drawing style. unlike you though, i don't believe it would have been a 'better' book if the artwork had erred more toward the Leonard Starr side of things. i think the style was absolutely appropriate. as for 'why the recent acceptance by the tastemakers ?'... you know how the art establishment became comfortable with certain types of illustration from the 1950s (Ben Shahn etc.) once it started to include 'modernist' influences but remained sniffy about virtually all the preceding stuff ? ... same thing with comics. it's not so much that the technical drawing skills in comics overall declined and acceptability followed; it's that a new generation of artists began producing work that referenced various genres of modern / 'fine' art. in short: comics could now be 'avant garde'. the boxes were ticked. the gallery doors opened. Kev, the Acme Novelty Library i have is (i think) a compilation for the UK market published by jonathan Cape, and isn't numbered like the others in the series. i've also read Jimmy Corrigan: The Smartest Kid on Earth. going from what you've already said about your feelings for Ware's work and his outlook on life, i don't think you'll be converted by either of those books. I have to thank Dan Govar for reposting this. I don't agree that comics storytelling is lost, I think that if you look at mainstream books, no matter how hard they run, they are haunted by the spectre of Rob Liefeld and the nineties. I think of it as a filter that lowered the expectations. Partly I think the stories don't demand it of the artists either. I see a lot of books with two to three panels a page whereas in the past a story had 6 -9. That's an editorial and writing decision. I'm sure there are "lazy" guys out there who want to draw big splashy images and forget about story, but then there are the Chris Bachalo's( who balances splash with very tight storytelling) There are those of use who try to keep it going, there are excellent guys out there. I can begin a list and keep going. Just cuz they don't all draw like advertising artists from the 50's doesn't mean they aren't good. My first take on this post is that it is an either/or argument; it holds up one style and era against another style and era. So I agree with Laurence John: Apples to oranges. Michaelangelo compared to van Gogh? Why would we correlate? Is the real issue here the frustration that money and fame come to certain people as a result of "tastemakers"? The cream doesn't (and didn't) always rise to the top. Maybe because there's a lot more milk these days, people have to be willing to swim around a bit to find their taste in art, music, or any thing in the aesthetic realm. 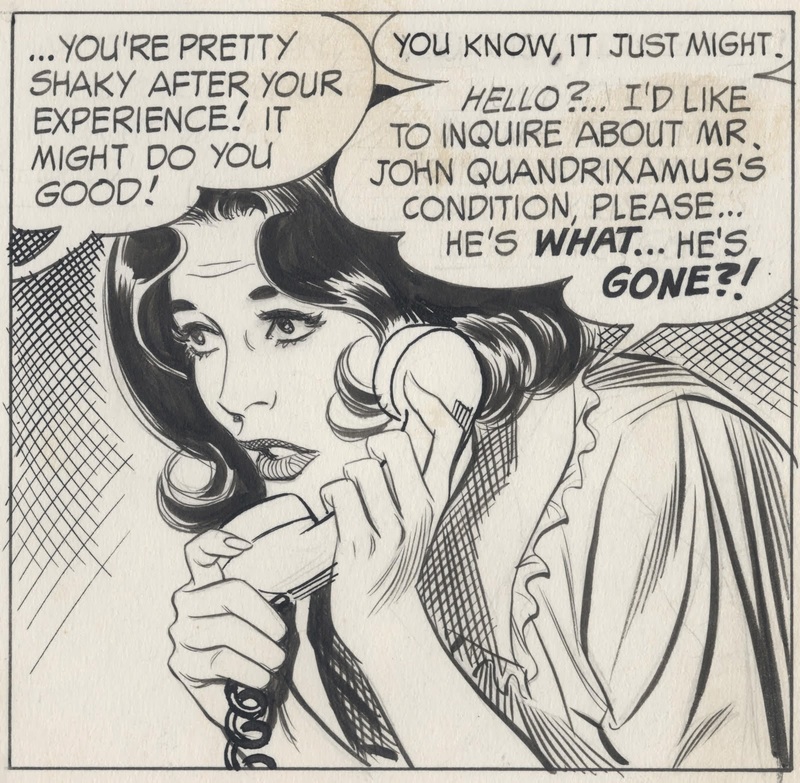 One thing that needs to be addressed here is that, in Leonard Starr's heyday, the comics page afforded larger panels that could accommodate such expressiveness.But as early as the late-1970s, the "funny page" was being made smaller and tighter. Expressive body language became more needless to depict because, thanks to the shrunken reproduction, no one was going to see it anyway. So what, you might ask, does that have to do with modern work that comes through graphic novels -- whole books with whole pages to work with? Look at the median ages of these new artists and you'll see their history is in the late-70s early-80s and so forth. They are emulating this rather emasculated reproduction because they did not have the frame of reference. They didn't have Alex Raymond or Milt Caniff. And they didn't have an industry that told them to look up Raymond or Caniff either. I give a pass to Spiegelman for three reasons: Maus is a powerful work, no matter how it is presented. Spiegelman came out of the underground comix movement which was very much about subversion, and not about representational fidelity. Finally, Maus is in a sense a parody of Krazy Kat, stylistically. It is like using that form to tell a much darker, more personal story. It is as if someone who didn't know comics used the medium to tell that story because the message was so important, this was the only way to wake the reader up to it. It is in part documentary and in part justification of Marshall McLuhan's "the medium is the message" assertion. Circling back, I think new artists should be better versed in those who came before. They should not use the past ten years as their tutorial. New filmmakers should be taking their cues from Hitchcock's Psycho, not Van Sant's Psycho...but that isn't how the world works. Not anymore, at least. The real issue here is, does the work move you. If it is crude but emotional, is it less than something that is luxurious but hollow? Laurence John-- Before we go too far down the path of Chris Ware's "bleak humor" I think we should first unbundle his drawing ability, which is my primary interest with this topic. There must be easily 100,000 people in the US capable of drawing the pictures in Jimmy Corrigan. All they require is a modest talent for technical drawing (as opposed to Starr's brushwork, which is a much scarcer commodity). What you like, I assume, is not so much Ware's drawing as the way he arranges the boxes with the drawings in them, and the "bleak humor" scenarios that he plays out with those arrangements and designs. That's not the end of the world, especially if Ware doesn't believe that cartooning is drawing, and so many people at the New Yorker and the New York Times share your affection for his scenarios. In fact, it may help explain my thesis that those fora seem insensitive to the language of good drawing because they are more concerned with the stories than the pictures. I'd be happy to discuss Ware's writing, and compare it with Starr's or Dostoevsky's, but if it is possible to isolate the drawing element, I think Ware's is pretty unremarkable and uses little of the language I am describing here. Kev Ferrara-- I love Elder's work too, along with some of the other early MAD artists, but my trophy for "funniest artist" seems to rotate, depending on whether I am in the mood for black humor, dry wit, sarcasm or slapstick. Recently I have been looking at the drawings of Richard Thompson and laughing out loud. I think he is brilliant and hope to share some of his sketches soon. rob-- Thanks for sending me Andrew Robinson, I haven't seen much of his work but I will look into it. Christopher-- Thanks, I don't disagree with you that their success stems from the fact these are stories that "work" in their totality, for reasons that are "probably impossible to formulate or deconstruct" in their totality. I have to wonder why it seems so difficult to maintain high standards for the visual element of the mix. Is the visual vocabulary I've discussed finally becoming obsolete after all these centuries? And if so, is it because our taste has dumbed down? Or perhaps because today's artists have found other concerns? (There are certainly lots of problems in the "fine" art world as well.) And what do we make of the fact that this is a particular problem with people who are bestowing the laurel wreath of "art" on comics today? Is the price of legitimacy a surrender of the visual component for an emphasis on the story element? Kev Ferrara-- I agree, examples of the hilarious Ware would be welcome. More importantly, I do agree with you that art ultimately has to stand on its own as a visual object, without regard for the "intent" of the artist. A poor visual object should not be resurrected by some written manifesto; if an artist is unwilling or unable to address the special attributes of visual media, they should find different media. When I suggested that we apply criteria that take into consideration the intent of the artist, I meant that we should not judge Calvin and Hobbes or Toth’s DC horror work by the same standards we apply to Pyle or Frazetta. They are running in different races with different measures for victory. But that is a visual determination, unaltered by polemics. we're going round in circles here. i've stated quite clearly that i think Ware's talent isn't down to traditional drawing skills - it's down to a graphic / cartoon approach to storytelling - so i don't know why you're asking me to discuss his drawing ability. Shane Chebsey-- Thanks very much, I was not familiar with the work of Jimmy Broxton but I am making a point of getting acquainted with it. Laurence John wrote: "my guess is that Maus won the Pulitzer Prize because of the content rather than the drawing style. unlike you though, i don't believe it would have been a 'better' book if the artwork had erred more toward the Leonard Starr side of things." I don't believe Maus would have been a better book if it was drawn in the style of On Stage. But I do think it would have been a better book if it had been drawn by one of many illustrators for Simplicissimus (Kollwitz, Grosz, Kley for example), Thomas Ott, John Cuneo (fabulous animals, and wilder than Spiegelman), Cober, or anyone who draws in the style of Goya's Disasters of War, or Steinlen, Forain, Lynd Ward, perhaps Alex Toth in his style of "Survival" for Blazing Combat. I think they all speak the visual language I am describing. I hope you are correct that "Maus won the Pulitzer Prize because of the content rather than the drawing style." I like Maus very much and could easily have kept my mouth shut about the competent illustrations, except that the New York Times declared that Spiegelman is the "Michelangelo" of the comic world, and other critics ootzed that Maus represented some marvelous cultural innovation, combining words and pictures. Personally, I disapprove of their neglect and disrespect for superior comic artists from the previous century. I think their standards today for the images that might accompany the words in a graphic novel are uninformed and unimaginative. And finally, I would like these pretentious venues to feel a little less smug for belatedly discovering a form of comic art that is acceptable to them. Steve Ellis-- I agree with you 100 percent that "Just cuz they don't all draw like advertising artists from the 50's doesn't mean they aren't good." I think there is a lot of excellent work being done today and did not mean to suggest otherwise. What I really intended to say is that much of the comic art that is now being celebrated as "legitimate art" is visually pretty weak stuff. I believe it is often celebrated by people who are word-oriented but who are both ignorant about the history of comics and blind to the vocabulary of visual storytelling (including that utilized by "advertising artists from the 50's"). Thus, when author David Eggers writes, "in terms of sheer aesthetic virtuosity Ware's book is arguably the greatest achievement of the form, ever," he strikes me as a flaming nitwit. Chris Bachalo and anyone else on your list who you think understands the vocabulary of art. I knew of Bachalo but I am always happy to learn of new artists. Cranky Bird-- for reasons discussed in other answers, I did not intend this to be an either / or comparison, and if I projected it as such, I apologize. I am a firm believer in keeping an open mind and applying a variety of standards as appropriate. On the other hand, I do disagree with the apples and oranges point. As I have noted in other answers, I think it is easy to find points where comparison is worthwhile and illuminating. In fact, I think it is humorous that artists who delight in boldly breaking down barriers and mixing categories suddenly become defensive and insist that dividing lines must remain intact and watertight when you threaten to compare them with art in an adjacent category. Dw. Dunphy-- I think you make some excellent points. I certainly agree that shrunken reproduction eliminated much of the incentive to work the way Raymond and Caniff did (and I don't fully understand why the re-opening of that potential with the emergence of graphic novels didn't lead to a return to that form of excellence). I would just add one qualification to your point that "The real issue here is, does the work move you. If it is crude but emotional, is it less than something that is luxurious but hollow?" I agree with your broader point, but the test for me is not totally subjective. If someone is moved in superficial ways by a crappy piece of art, that should not by itself redeem the art. We have an obligation to educate ourselves, and to think conscientiously about art. But as I have tried to emphasize in earlier posts (http://illustrationart.blogspot.com/2009/02/beautiful-writings.html) I do generally favor crude but emotional over luxurious but hollow. Coming late to the conversation, but I think, David, you have a good point. About a year ago, maybe longer, someone made a very similar point about the increasing simplification of visual arts in animated cartoons. I think it might have been Mark Kennedy over at his "Temple of the Seven Golden Camels" blog. He discussed, in particular, the way young animators were being taught to draw, and what was rewarded as "good" cartooning in contrast to earlier styles with much more subtlety. Perhaps part of this is about our expectations of the audience. You (and I) expect someone reading a panel to actually attend to the visual elements--seeking out details and subtleties that enrich their experience. Whatever the recently enlightened critical crowd expects of the audience is anybody's guess.